shaping wood than any other hand or power tool. and different from the next. The variety is endless. "The most fun you can have with a piece of wood!" of the wood and utilize all of the properties to fullest. 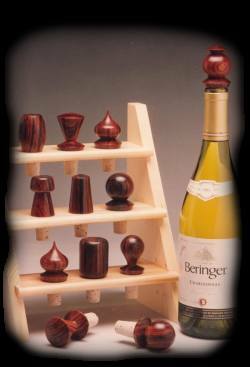 wine stoppers. It is all truly a labor of love. Nick's shop are available for student use. 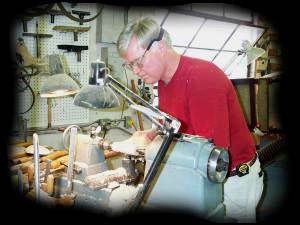 Nick Cook owns and operates the only full service woodturning studio in the metropolitan Atlanta area. In addition to demonstrating and lecturing at universities, craft schools, and woodworking shows throughout the US, Australia, and New Zealand, Nick also teaches at his studio in Marietta, Georgia. Individuals with existing skills may wish to focus on specific areas of woodturning. We can customize the instruction to meet your needs. Just let us know where your interest lies and we will put special emphasis on developing those skills and techniques. Starting with the basics, a day long, one-on-one workshop will include something for everyone interested in the art of woodturning. Nick will discuss and demonstrate a wide variety of turning techniques from simple spindles to hollow vessels. 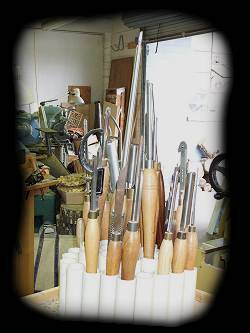 He will cover tool selection and sharpening along with the fundamentals of woodturning. The first half of the day will cover a assortment of spindle projects including: honey dippers, baby rattles, turned boxes, spinning tops and wine stoppers. Nick will discuss chucking systems and show how to use the skew, roughing gouge, spindle gouges and scrapers for center work. He will explain how to utilize jigs and fixtures to speed production. The afternoon will be devoted to bowl turning and hollow vessels. You will learn how to sharpen deep fluted bowl gouges to get the best results. Nick will start with a simple open bowl and show how to use a variety of chucking techniques. He will explain various ways to finish the bottoms of bowls. Natural edge bowls and turning green wood will follow. You will learn how to avoid the problems that usually come with turning green wood. Last on the agenda will be a discussion of hollow vessels and the specialized tools for turning them. Nick will demonstrate several of the special tools available and discuss the problems associated with hollowing. Group workshops are also available. Class size is limited to three students to insure personal attention. Students of all skill levels can be accommodated. The 1500 square foot studio has Delta, Powermatic and General lathes available for your use. Grinders, sharpening jigs, turning tools, chucks and finishing supplies are available for student use. Wood is supplied. Students are encouraged to bring their own turning tools. The fee for individual one-on-one instruction is $250 per day per person based on an eight hour day starting at 9:00 a.m. and ending at 5:00 p.m. A two day workshop is $450. A half-day class is $150. Workshops and seminars held at other locations for clubs and organizations run $500 per day plus travel expenses, meals and accommodations. Call or write for more information. Nick has produced two new DVDs covering a wide range of turning techniques. Turning for Food: Nick demonstrates how to create nine items that are useul in the kitchen: honey dipper, spurtle, rolling pin, wine stopper, coffee scoop, salt urn, pepper mill, plate, and bowl. $29.95 plus shipping and handling. Turning for Fun and Profit: Nick demonstrates how to create eight items that are fun to make and easy to sell: garden dibble, snowman ornament, baby rattle, spinning tops, tea light, lidded box, goblet with captured ring, and bowl. $29.95 plus shipping and handling. Note: To order, click the Order Videos Now button and select the number of videos you want to purchase. Then enter your state, zip, and country and click the Calculate Shipping button. That will take you to a secure check out page where you can select your shipping option and fill out your shipping and billing information. Or just call Nick to place your order!